Laser Treatments; how does it work? Dr. Mungekar is a top rated physician in internal medicine. She is a Board Certified Physician and completed her residency from UC San Diego in 2006. She founded Orchid Cosmetic Medical and Wellness Center in Los Gatos in 2011. We have helped hundreds on women and men in our office with Botox and Dermal Fillers to ease signs of aging and restore natural, not frozen, look in medically responsible and aesthetically pleasing fashion. Botox and Juvederm Combination - Restore Natural Look. If you are considering these elective procedures, you are not alone. How much Botox do I need ? It depends on which areas you want to be treated and how deep your wrinkles are. Men require more unites than women in the following table suggested as a general guidance. Results for Botox last 4-6 months. 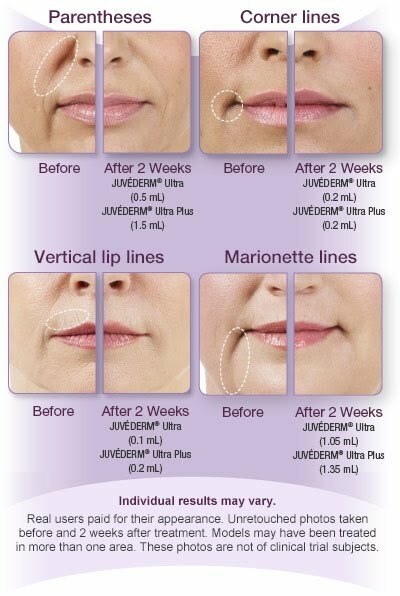 For laugh lines (nasolabial folds), marionette lines (around corner of mount) and to add volume to lips, we use Fillers. If you have limited budget, it is important to have realistic expectations and focus on areas most important to you. Many offices offer complimentary consultation for cosmetic procedures. There are many fillers available in the market today for different needs. Juvederm is the most popular one in our office. Other commonly used fillers in the United States include - Juvederm Voluma, Restylane, Radiesse, Sculptra and Boletoro. What should you consider when choosing a practice for Botox & Juvederm Treatment ? Botox pricing is by number of units, not by area. You pay only for what is used. Currently there are Groupon offers in San Jose at $189 for 20 units - be aware to check reputation and user experience. 20 units is unusually not enough. Additional units are then sold at $13-$15/unit. In the book by "The Best Skin of Your Life Starts Here : Busting Beauty Myths So You Know" - skin care advocate Paula Begoun recommends that never have your dentist or gynecologist perform any cosmetic corrective procedure for you. Just because your dentist knows what to do when you open your mouth doesn't mean he or she has extensive medical education and training needed. We have come across new comers to bay area with background as Pediatrician moonlighting and doing Botox "on-the-side". Also, in California it is illegal for Nurses to own medical spas. It is not uncommon however to work around this by having a namesake medical director who has none to minimal training in cosmetic procedures and the nurse operates under the physician's license and insurance in return for a "cut". If a physician is not in the house, one should confirm if the safety practices are being followed. Click here to subscribe to our newsletter and receive promotions!